I know I should go to the doctor, but what could this be? About a year and a half ago I noticed a little somewhat itchy bump on my upper arm, about the size of a bug bit, and in fact it did have two very small “puncture” holes. It stopped itching after a week but the bump remained, at this point it looked like a pimple that never fully formed. Not to be gross but I did try “popping” it and there was nothing, so I ignored it. Over the past year it has grown in size under my skins surface. It is currently about the size of a dime in circumference and feels like its about as thick as a small marshmallow. Now it doesn’t itch anymore, but if its touched it hurts. If its moved, like pushed on from the side it feels like its attached to muscle and is being ripped off of it. It had stopped growing for about 6 months and last week I noticed that there is another section starting to grown on it, mind you this is all under the surface of my skin. I have a few friends and friends parents that work in the medical field i.e. 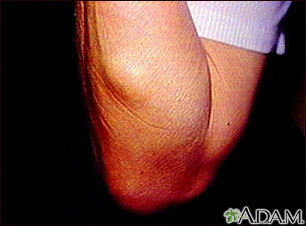 are nurses or people like that that tell me they think its just a benign cyst. If it is would it still grow and hurt when touched and sometimes hurt when not touched? The reason I haven’t gone to the doctors is because frankly I dont have the money or insurance, and no I cant afford insurance either. So what do you think it could be? Any ideas are helpful. I know everyones first thing to say is “go get it looked at”, but thats not an option for me right now. So im just trying to get other ideas on what it could be other then a benign cyst. A benign sebaceous cyst. Or a boil. You will probably need to get it lanced and drained. Then the doc can put in idoform gauzewhch will have to be changed once a day until the tissue granulates and fills in from the bottom up. Otherwise it will leave a void that will re-fill with pus. Sorry. If you can’t afford a private doctor, try the Health Department. a parasite or cancer?... two puncture wounds you say…. it is either a insect/spider bite or you’ve been bitten by the vampire . @talljasperman I watch that show “Monsters Inside Me” and sometimes I get scared that it could be something like that because it did start out with 2 puncture holes!! It started out with two puncture holes because it was a bite. It got infected but your body has a lymphatic system so was able to quell it. But all those extra wbc’s clotted and got stuck there instead of being reabsorbed. Then the pore got covered over and the naturally occuring sebum had nowhere to go so it started filling up. It got hard on top, but underneath it may or may not be runny. Now it is in a closed off sac and is attached to a feeder vein. It will stay there and cause you some pain from time to time. It may even begin to ache and if left alone it could burst on its own. Or, you have a furuncle. The bite could have allowed in some staph and it lodged in a hair follicle. Pus and dead tissue collected and grew until it is the size it is now. This too can burst on its own. A furuncle can also grow and extend to several pores and actually build a network of pus filled pockets underneath your skin. Once staph is in your skin like that you are open to all sorts of complications. Going to a doctor really is your best bet, and as I stated earlier, the Health Department can see you if you can’t afford a private doctor. @Trillian thank you! The one thing that confuses me is that in April i had an accident where i was in the hospital for a long time, i was hooked up to antibiotics and had numerous CT scans, nothing was said about my arm lump and nothing changed with with all the medication and such that they had me on. i would think that if it was serious wouldnt they have mentioned something about it or noticed it? there were meny times it was brought up that i have something there, like when they needed to check my blood pressure they couldnt put the arm wrap thing on that arm because it would hurt me and we would tell them thats why, and still no one said anything or questioned it. @talljasperman thank you, I hope it isnt anything serious. I dont really know the new changes in the medical insurance area, but the last time I check you still had to pay to have it. And no matter how cheap it may have become I still cant afford it. You do not have a furuncle. That is another name for a boil, and those don’t last for months to years, especially if you’ve been on strong antibiotics. You also do not have Lyme Disease, as a thick subcutaneous nodule is not how Lyme manifests. Your best bet is to try to find a free clinic in your area, if they exist. Re: @Trillian‘s post, If you’re especially bold, you could lance it yourself. -They even sell the idoform gauze. So far the closet picture is the sebacious cyst, though my lump does not stick out that far, you can barley see theres a bump, thats how far under the skin it is, but the non shiny reddish coloring is the same with a little brown,grey and purple color mixed in to it, though that only is on the bump, and no where around it. I strongly suggest that you NOT attempt to lance something that is highly unlikely to be an abscess. You are as likely to CAUSE a superinfection as cure one. Do you have any funny sedation/anesthesia/pain med stories? Have you ever heard of any adult whose skin is so dry (for whatever reason) that they need to take sponge baths on an ongoing basis, for long periods of time? How can I wake my body up? What does a bulging forehead mean? Is alright to self diagnose a problem that isn't detrimental to my health at the moment? Why do some ppl's feet stink, while others don't?